Yay! I have now officially finished work until after the arrival of little wish number 2. Let's say it again, Yay! 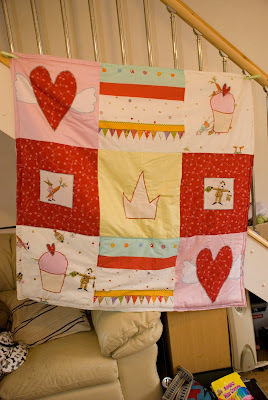 I have actually also managed to finish the bed spread (For Alexandra)! I know, only about a year in the making (someone should sack me really) but it is now done. I still have the curtains to do but must admit I've been putting it off because the thought of that much fabric to handle isn't particularly pleasant. On another crafty note I have FINALLY started making something for squigglepop (not such a mean mummy now). I have started 2 crochet blankets, but I can't show you them until after baby puts in an appearance in October because the colours of the yarn will give the game away. Sorry! One is double crochet which I will edge like this one here, and the other is a granny stripes pattern which I'm really loving. I wasn't so sure when I started it, but now I'm quite pleased with it. 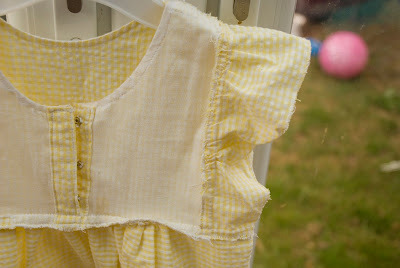 Alexandra has just had a new top made by mummy from a gorgeous small lemon and white check cotton (seen below). I've been wanting to make something like this for a while but finally sat down to draw up a pattern for it on Friday day. The pattern took me about an hour and is only ledgible to me. That's fine, I can work with that. I'd actually had a search through my fabric stash and was disapointed to see just how low I am on pretty cotton prints (I've left mum with instructions to keep an eye out at car boots when she goes) but there was this lovely check in my drawer which I could just imagine into a pretty summer top (if only it were that easy!). So, Friday evening (Mr Bogert was away "team building") I sat down to actually make the top. I used a lovely soft white muslin to line the bodice and instead of fiddly french seams, I just used the zig zag to edge all the seam allowances (which still looks very neat). I took me about 2 1/2 to 3 hours in total. I was making it up as I went along. The fastenings are press studs with white buttons for decoration. Once I tried it on the small person it need a little bit of tweaking under the arms (which I will fix on the pattern for next time) but I was really quite proud of myself. I just kind of sat there and though "Wow, I actually made that". I think it's just been so long since I've made an item of clothing that wasn't fancy dress! 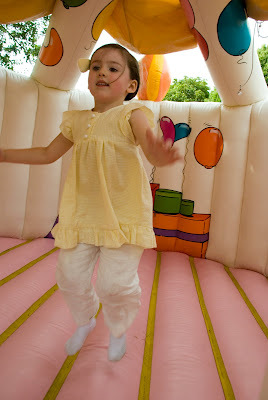 It was ready in time for her to wear to Joshua's 3rd birthday party (small person and the birthday boy above). Joshua is my godson, my cousins little boy and we had a fantastic time at the party. 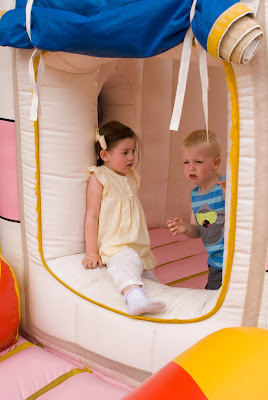 They hired a big birthday cake shaped bouncy castle :). Or would you expect them to be finished diferently? 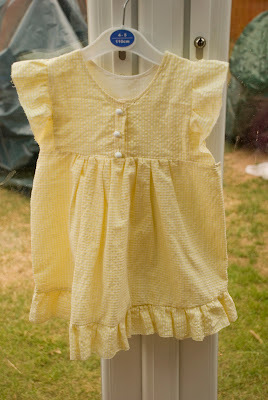 How much would you want to pay for something like this (to fit a 5 year old)?